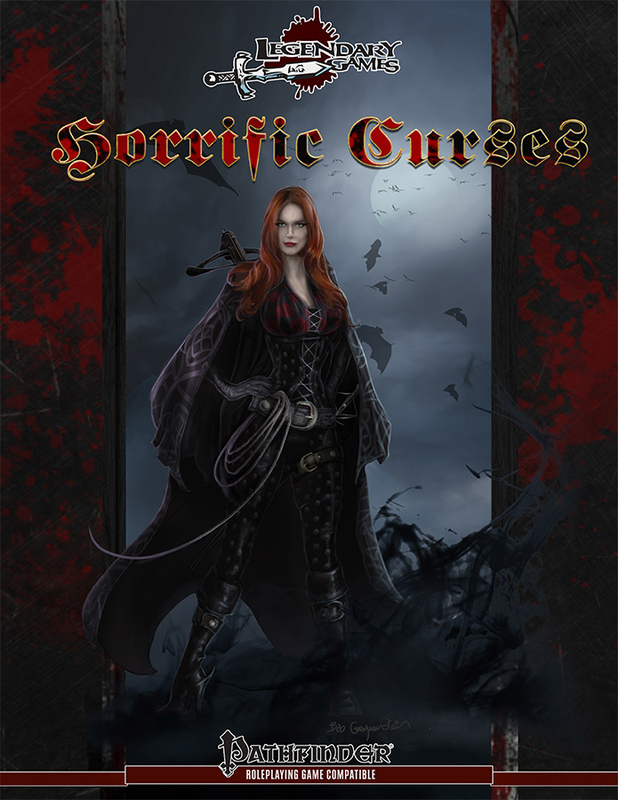 Horrific Curses will bring your Pathfinder PCs to their knees begging for mercy from this collection of curses! This book brings you brand new accursed archetypes, including the accursed witch, hex hunter, and jinxed sorcerer bloodline. It also introduces a new category of magic, the dying spell, with 10 new spells like call the avenger and funeral pyre to allow heroes and villains alike to cast their spite upon their foes with their dying breath. Add to this nearly 20 brand-new curses from famine's feast and labile lunacy to kinslayer and hatemonger's halo, including spellblights and mythic curses, with each one as detailed as it is diabolical to create memorable curse effects that are vividly virulent. If you've ever wanted your curses to be more than just a simple spell, something to inspire delightful terror in your players, bring home the horror that only curses can deliver, grab this book 26-page supplement by Jason Nelson, Jen Page, and Alex Riggs today and Make Your Game Horrific... and Legendary!